Debtor Name: Bertucci's Holdings, Inc. The Debtor owns and operates 59 restaurants in the Northeast and Mid-Atlantic. They employ 4215 people. 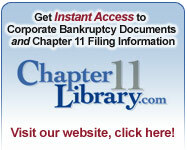 Need to quickly learn about new food/beverage Chapter 11s? We can help. Sign up for a free trial now! Debtor Name: Zitner Candy Corp.
Our daily list includes every commercial Chapter 11 case nationwide. Sign up for a trial now! Debtor Name: Miller's Delicatessen, Inc.